At 475 we agree with Joe Lstiburek, that we must make safe and robust enclosures. And 475 agrees with Owens Corning, and Achilles Karagiozis that the current code was written for the spray foam industry and we can make safe unvented roofs with fiberglass insulation given the right approach - and that educating code officials for approvals of such systems is essential. So building inspectors and plan examiners please take notice: we want to work with you and show we need not rely on toxic and unreliable spray foam but can instead safely and robustly use fiberglass insulation. But must we be stuck in climate zones 2B & 3B? What about the zones where most of you live and work: 4, 5 and 6? In this post we will show, that while the ProPink Unvented Insulation System may provide a safe roof in zones 2B &3B, if we instead combine dense fiberglass insulation (batts or densepacked) with INTELLO smart vapor retarder and airtight membrane we can make safe and robust unvented roofs in climate zone 6! Codes should provide the minimum parameters for performance, safety and durability. For instance IBC# does indicate that wood moisture content should be below 19% when installed, a dry roof (no condensation or leaks) is a healthy, structurally sound roof. However since the Energy Code continues to increase R-value minimums, the risk of condensation/moisture accumulation in roof assemblies in cold and mixed climates has increased too. The only solution the code provides to this moisture drive issue is to add "sufficient" air-impermeable insulation below the deck to theoretically keep protect the sheathing from condensation/moist air-currents. None-the-less, it is known that an air-impermeable insulation layer will only work as an air barrier/vapor control layer, if it is also installed as one (board seams taped, spray foam mixed/applied correctly). This work not only should be performed meticulously, it should be verified by a blower door. However, if the installation is sloppy or not durable (foam shrinks - cheap tape is used or worse - caulk), the "airtight" insulation will not be airtight for very long. If the airtightness fails, then the risk of damages/rot or mold in the assembly increases substantially. You might get lucky, but if things go wrong - the consequences are costly (repairs, healthy problems, etc). We have gotten assemblies approved in several jurisdictions while working with the authorities having jurisdiction (AHJ), such as the building inspector, to show that one can design and build a roof that has air-premeable insulation (fiberglass, mineral wool, sheepswool, cellulose, etc) that can be declared "air-impermeable insulation" with an air barrier which is also a (very) smart vapor retarder: INTELLO Plus as an integral part of the insulation installation. From experience, 475 knows that with the Pro Clima system, one can quickly make a very durable airbarrier. Every month we have dozens of customers that blow-by 3.0ACH50 and many reach 0.6 or better for Passive House certification - with more and more hitting 0.3 and lower. Since this membrane is part of a complete airtightness system from Pro Clima with TESCON tapes, gaskets, and adhesives - we know that the contractors can reliably build and roof assembly that is durably airtight (100 year lab tested tape) on the interior and can verify this with a blowerdoor test. Giving the AHJ confidence that the WUFI's as shown below, can be relied upon - because without a certain level of airtightness, no reliable performance (not with INTELLO, not with foams). If Owens Corning ProPink Boxed Netting is a Step Forward, Then INTELLO is a Leap Forward Joe Lstiburek called the ProPink Boxed Netting in the GBA article "brilliant" and "fabulous", and Martin Holladay notes the netting is well designed. Both may be the case. But it should be noted that it is this netting material that is the cause for the system's narrow reach. The netting is vapor open and not airtight. Airightness is to be provided outboard of the insulation at the sheathing with canned spray foam, as GBA notes. Consequently, if the ProPink system is installed in a cold climate, the conditioned air can easily reach condensing surfaces and cause moisture damage. (And of course, airsealing is so important because air can carry 100x as much moisture into the structure then diffusion will - leading to damages much faster.) But if the fiberglass is held in place with INTELLO membrane - the insulation has vapor control and airtightness inboard, where it should be - the conditioned air stays in the conditioned space and away from condensing surfaces. 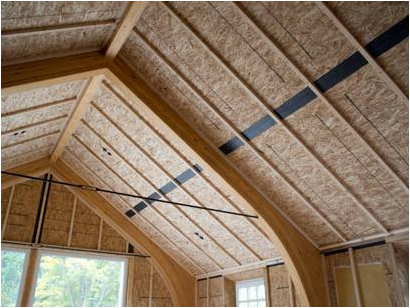 To extend the use of non-foam insulated attic and cathedral ceilings with asphalt shingles, we have WUFI-ed a challenging roof in climate zone 6. The assembly has vapor closed, light colored asphalt shingles on the exterior over OSB sheathing. It avoids vent baffles, ridge vents etc - so considerably faster to construct both for new builds as well as renovations. The required R-49 in Burlington VT (climate zone 6) was made with dense fiberglass. We then assessed the performance of such roofs with different interior airbarriers, each with different vapor permeability profiles: ProClima INTELLO Plus as the vapor variable retarder (0.17 to >13 perms), 6 mill polyethylene (fixed 0.05 perms), painted 'airtight' drywall (15 perms) and siga majpell (fixed 0.7 perms). We want to know if air-sealing the insulation with these materials on the interior will lead to safe assemblies (ie once with some reserves to deal with unforeseen moisture) , that are easy to build or to retrofit. Since we modeled the worst case roof, steep north facing, 10:12 pitch and light grey shingles - the solutions shown is a foam free cathedral ceiling that can be used throughout climate zone 6*, that use a limited number of readily available materials in a cost effective, durable way, with repeatable, easily verifiable methods that work for any orientation or shingle color. We want a roof with dependable performance: one that has reserves so it can deal with some small airleaks (at 3.0ACH50 small leaks can be expected). Another objective is to have an assembly that does not require foam and is easy to install - applying batts in between rafters can be done fast and cost effectively - the cost of INTELLO Plus and TESCON VANA is less then the minimum required layer sprayfoam - and does not require biohazard suits to enter the enclosure, nor do homeowners have to evacuate the house. In this WUFI study, we did assume a airtight construction with only minor airleakage into the insulation layer. (Contractors must blower door the building and confirm airtightness.) 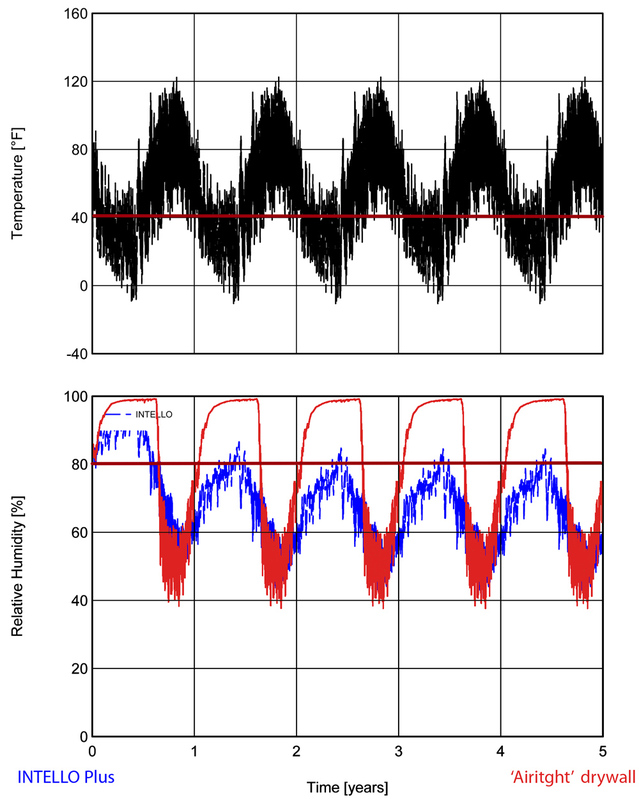 The first graph below show total moisture content over 5 years from different approaches. The assemblies sealed with 6 mill polyethylene and siga majpell on the interior are getting more damp every year - this is an indication one can expect issues in those assemblies over time (rot/mold). The moisture content in the INTELLO Plus roof decreases and stabilizes at a safe level in year one. Do note that the drywall roof goes off the chart every winter. This should be a red flag as well. 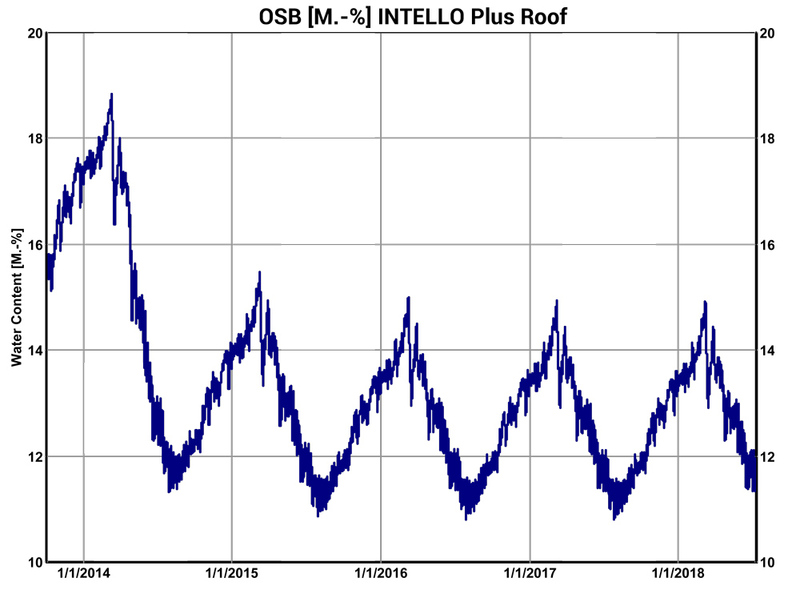 If we look at the graph below, we see that there is condensation on the OSB - it's RH maxes out in November and it stays wet the end of May - so even though this roof dries out every summer, there are concerns for structural degradation and mold in this roof. We should then also look at the relative humidity thresholds that ASHRAE 160P has defined. It states roof assemblies will be safe and reliable if 30 day averages of relative humidity do not exceed 80%. And if it does exceed 80%RH, then the temp should be below 40F - which is too cold for rot and mold to occur. The graphs below show that with airtight drywall the sheathing is saturated in the winter. But with the INTELLO roof, only when the sheathing is extremely cold - temps in low single digits - that the OSB sheathing goes above 80%RH. This spike in RH can be explained, because when it is that cold, given laws of physics, materials hold less moisture, hence the RH briefly increases during those cold snaps. A second safety check can be done in this case. It is generally accepted that if equivalent moisture content of wood stays below 18M% it will not degrade. For OSB we like to stay a bit lower - 15M% is a more conservative threshold, as it allows for some reserves in the structure. Below is the M% shown for the OSB sheathing. Except for winter #1 (when there is some residual construction moisture being pushed into the OSB) - the OSB stays right below 15M%. Drying reserves - sufficient at R49, convincing AHJ and can you do more? 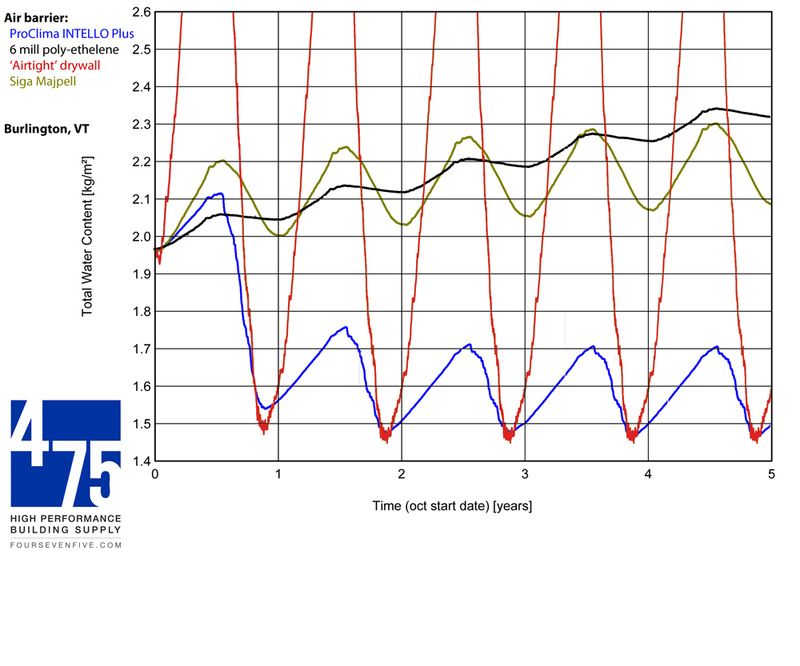 This WUFI Pro modelling shows, that in climate zone 6 - unvented R49 asphalt shingle covered roof can be build without foam, and have a sufficient amount of reserves that enable it to cope with some unforeseen moisture ingress. As shown, it does need a vapor variable membrane that modulates from very vapor closed (0.17 perms) to really permeable (over 13) -> INTELLO Plus, that is installed in an airtight, verified manner (TESCON VANA tapes, gaskets, blowerdoor), with fibrous insulation that completely fills the bays (class I install for batts, density checked for blow-in insulation). For any cases that go beyond R49 or require assistance convincing the AHJ in your specific location/climate zone - please contact us as we are happy to assist with additional WUFI models. We applaud Owens Corning's efforts to to develop new and inovative solutions that reduce our dependence on spray foam. 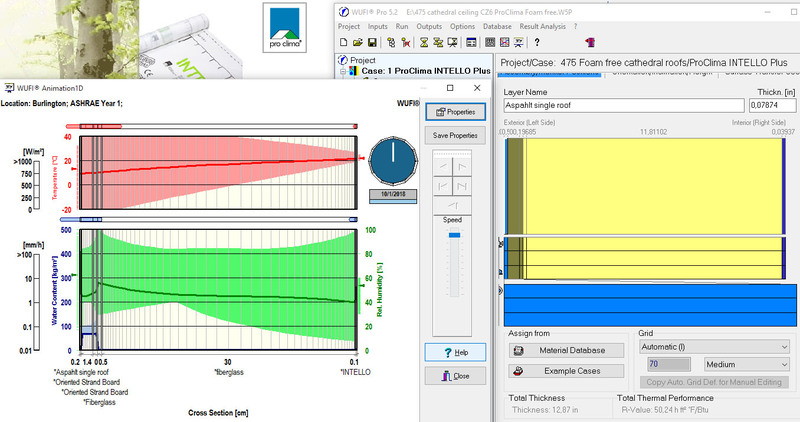 INTELLO is a great partner with fiberglass to move this approach across most of our climate zones. If you are an architect,an insulation installers and contractor can design and construct high performance roofs - that make plan examiners comfortable. If you need additional support or WUFI files for your location - please contact us.